68 THE SHOP NOVEMBER 2018 SKETCHBOOK PROJECT VEHICLE 1940 DODGE TRUCK Spark plug manufacturer E3 is sponsoring a 1940 Dodge truck project custom-built by Cool Hand Customs of Middleton, Wisconsin. The pickup will be entered in the 2018 SEMA Show Battle of the Builders competition and displayed in E3's booth #71000. 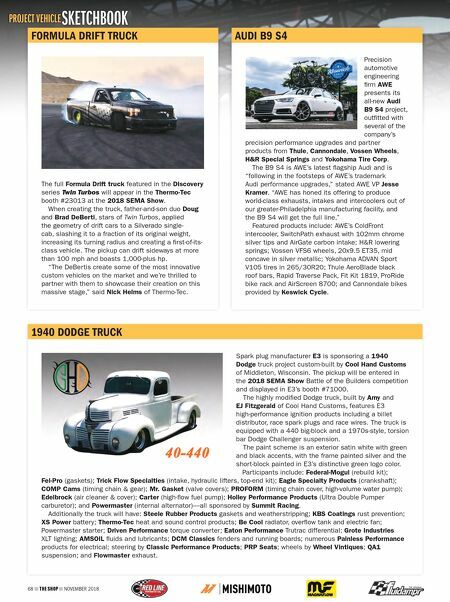 The highly modified Dodge truck, built by Amy and EJ Fitzgerald of Cool Hand Customs, features E3 high-performance ignition products including a billet distributor, race spark plugs and race wires. The truck is equipped with a 440 big-block and a 1970s-style, torsion bar Dodge Challenger suspension. The paint scheme is an exterior satin white with green and black accents, with the frame painted silver and the short-block painted in E3's distinctive green logo color. Participants include: Federal-Mogul (rebuild kit); Fel-Pro (gaskets); Trick Flow Specialties (intake, hydraulic lifters, top-end kit); Eagle Specialty Products (crankshaft); COMP Cams (timing chain & gear); Mr. Gasket (valve covers); PROFORM (timing chain cover, high-volume water pump); Edelbrock (air cleaner & cover); Carter (high-flow fuel pump); Holley Performance Products (Ultra Double Pumper carburetor); and Powermaster (internal alternator)—all sponsored by Summit Racing. 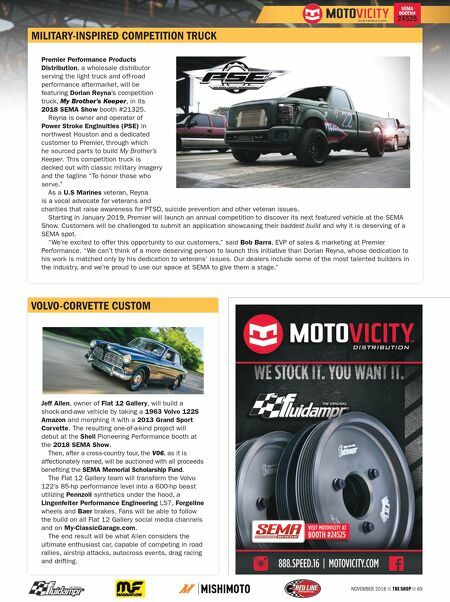 Additionally the truck will have: Steele Rubber Products gaskets and weatherstripping; KBS Coatings rust prevention; XS Power battery; Thermo-Tec heat and sound control products; Be Cool radiator, overflow tank and electric fan; Powermaster starter; Driven Performance torque converter; Eaton Performance Trutrac differential; Grote Industries XLT lighting; AMSOIL fluids and lubricants; DCM Classics fenders and running boards; numerous Painless Performance products for electrical; steering by Classic Performance Products; PRP Seats; wheels by Wheel Vintiques; QA1 suspension; and Flowmaster exhaust. FORMULA DRIFT TRUCK The full Formula Drift truck featured in the Discovery series Twin Turbos will appear in the Thermo-Tec booth #23013 at the 2018 SEMA Show. When creating the truck, father-and-son duo Doug and Brad DeBerti, stars of Twin Turbos, applied the geometry of drift cars to a Silverado single- cab, slashing it to a fraction of its original weight, increasing its turning radius and creating a first-of-its- class vehicle. The pickup can drift sideways at more than 100 mph and boasts 1,000-plus hp. "The DeBertis create some of the most innovative custom vehicles on the market and we're thrilled to partner with them to showcase their creation on this massive stage," said Nick Helms of Thermo-Tec. AUDI B9 S4 Precision automotive engineering firm AWE presents its all-new Audi B9 S4 project, outfitted with several of the company's precision performance upgrades and partner products from Thule, Cannondale, Vossen Wheels, H&R Special Springs and Yokohama Tire Corp. The B9 S4 is AWE's latest flagship Audi and is "following in the footsteps of AWE's trademark Audi performance upgrades," stated AWE VP Jesse Kramer. "AWE has honed its offering to produce world-class exhausts, intakes and intercoolers out of our greater-Philadelphia manufacturing facility, and the B9 S4 will get the full line." Featured products include: AWE's ColdFront intercooler, SwitchPath exhaust with 102mm chrome silver tips and AirGate carbon intake; H&R lowering springs; Vossen VFS6 wheels, 20x9.5 ET35, mid concave in silver metallic; Yokohama ADVAN Sport V105 tires in 265/30R20; Thule AeroBlade black roof bars, Rapid Traverse Pack, Fit Kit 1819, ProRide bike rack and AirScreen 8700; and Cannondale bikes provided by Keswick Cycle.